It’s been a tough holiday for Roy. A bad cold, an unshaven face, thick, wirey, gray hair, and a wide-eyed son tentatively squinting up at him. Time for the shears. And don’t forget to sprinkle the hair clippings in the compost. Yes, you can compost hair clippings! That’s right. Hair is mostly made of nitrogen- rich keratin, which have long chains of amino acids. And while some Gardenweb comments were valid (not to mention amusing) regarding the use of hair as fertilizer, we’ve had no problems as the relatively short hair clippings are a minor “ingredient” in our compost bin. Hair decomposes very slowly – which is a desireable attribute for something that is nitrogen-rich. 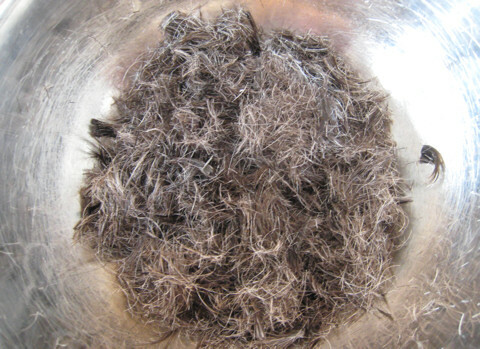 In rural areas, some people have used human and pet hair successfully to ward off deer and varmint by scattering them liberally on the perimeter of their gardens. However, this tactic is not likely to deter animals like racoons that live close to humans in urban areas. Don’t start collecting garbage bags full of hair from salons or barbers as they may contain garden-unfriendly chemicals (gels, sprays, etc.). Also, it’s best to keep more unusual compost ingredients as minor additions to your bin. Is Stevia The Next Big Zero-Calorie Sweetener? Our stevia plants still survive! We bought our first stevia plants at the local nursery this year after reading about their natural sweetness (over 300x sweeter than sugar!) in one of our seed catalogs. It’s a sun-loving plant, and we’re still figuring out if it will survive in our cool, N. California coastal climate. Coincidentally, we recently learned that stevia is set to be the next BIG zero calorie sweetener in the US. 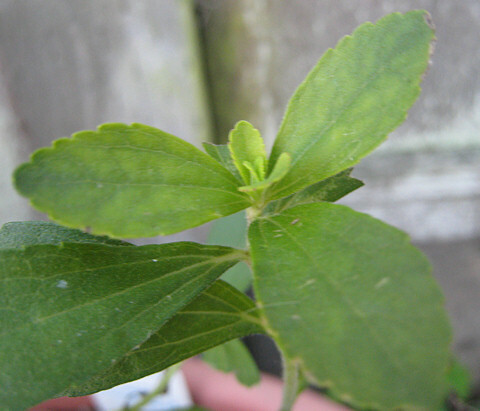 When you nibble on a stevia leaf, it does have a very sweet flavor, though you’ll note a slightly bitter licorice or “greeney” aftertaste. In 1931, two French scientists discovered the “sweetness” chemical in stevia and developed an extraction process that eliminated the aftertaste. In 1989, a petition was made by a Brazilian company, Stevita, to classify stevia as GRAS (generally regarded as safe). But the FDA required testing which would have amounted to $10 million, and the petition was withdrawn. In 2007, PepsiCo and Coca-Cola bankrolled testing to get the FDA to approve stevia as GRAS. While these beverage powerhouses will not reveal their stevia-refining secrets, there are several patents out there that will give you a general idea. 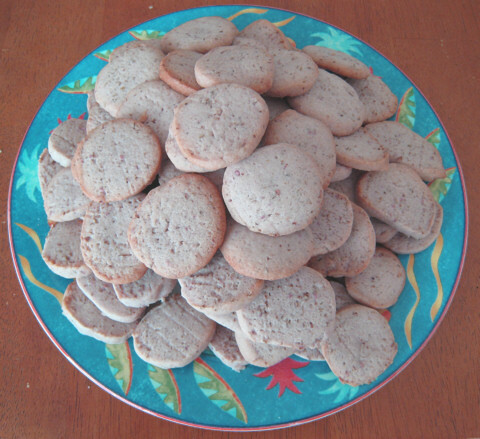 As of Dec. 17, 2008, the FDA finally classified stevia as GRAS. Though we haven’t tried this yet, we also learned that a water extract can be made by boiling or soaking fresh or dried leaves leaves, and then straining. However, alcohol extraction is believed to yield better results than water extraction. Cargill claims their first step is water extraction in a Truvia™ infomercial. They are going to team up with Coca-Cola to develop the new zero-cal beverage sweetener. PureCircle (which supplies Coca-Cola and PepsiCo) also has an infomercial on their PureVia™ stevia sweetener. If stevia products take off, the outlook for Equal® and SweetNLow has a good chance to sour. Is there an uncrabby crab? Stories of how Native Americans buried fish in their maize fields to fertilize their soil go way back to grade school. 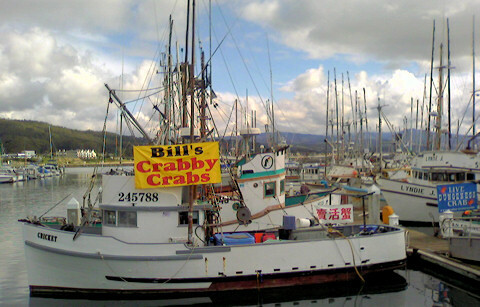 Funny how it all came back when we decided to do the same with fish and crabs we buy at the local harbor. We once bought a whole halibut, fileted this giant on the driveway, and then buried the remains over a foot deep in our garden. Our dungeness crab season opened up in Nov. and we’ve had several feasts over the past month. We bury the shells and inedible parts a foot deep in the garden, chop it up and work it into the soil, clean up the shovel, and then put fresh soil at least 6 inches above the crab compost lest racoons and other critters should make out the scent. 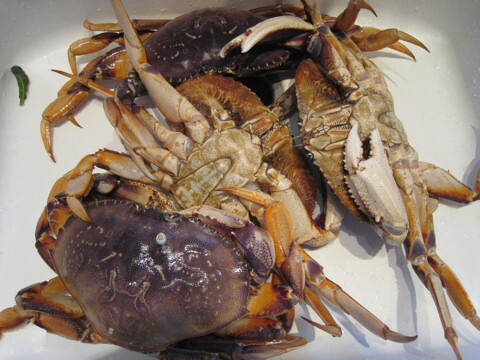 In 3-6 months, the crab shells, composed primarily of calcium carbonate, nitrogen-rich proteins, and chitin (a cellulose with nitrogen groups) will be transformed into a nutrient-rich white powder. Every now and then, we’ll see a tenacious claw, but even that will eventually soften and decompose! Before shutting off the kitchen light, what's on tomorrow's menu? just after having finished supper. “Huh, what?” unable to sit up straight in my contented stupor, thinking of our fortunate lot, slightly scandalized and stricken with a bad conscience. This banquet before us – potato leek soup and grilled swordfish steak – hasn’t even been digested, and now you want our opinion on what to fill our bellies with tomorrow?!!? “Vell I need to know vat to cook!” he barks impatiently. He’s right, as always. Menu planning IS everything and saves time and money, limits food miles, manages stress. It encourages you to eat healthier because let’s face it, unless you’re on a raw diet, eating whole foods often takes a bit more time to prepare. I thought about this when preparing brown and wild rice tonight. It takes about 30 min. longer to cook than white rice but is substantially healthier. But if you don’t plan it right, dinner could either be delayed, or comprise less healthy (but more expedient) options. What needs to be set out tomorrow long before dinner time? What will take longer to prepare? You don’t need to have a full week’s menu laid out, but it sure helps to lower stress and eat healthier by spending a few minutes to think about the Whats, Hows and Whens of tomorrow’s dinner as you shut down the kitchen for the night. 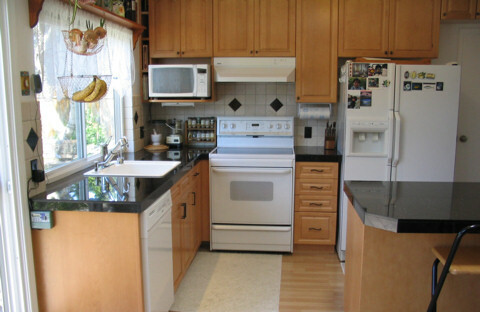 Ever see those spacious, expansive, to-die-for kitchens on Sunset Magazine? Better Homes and Gardens? Town & Country? Those photographs can make one feel terribly inadequate, a total bungling fool for having purchased a house with a custom-made kitchen for anorexic, ill-equipped inhabitants. 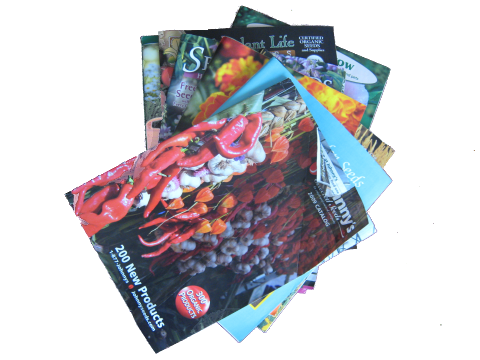 Then there’s the garden section of same journals. Wide open spaces accentuated with willow trees gracefully leaning over a koi pond. A gentleman’s farm replete with a 4WD compact tractor lies just a five minute stroll south of the estate. Wake up! Back to reality. Though, yes, we’ve envied veggie garden acreage from our garden planning software users, for the most part, many people are working with limited space-sources both in garden and kitchen. It was gratifying to see that food personalities like Mark Bittman feel wonderfully at home in cramped, NYCity-apartment-scale kitchens. The NYTimes recently launched a new video series called “Tiny Kitchen“. Plangarden Kitchen is where guests congregate – not the (also cramped) living room. We put our friends to work or happily chat peeling garlic while they enjoy their favorite beverage in anticipation of the 40 Clove Chicken. Our most critical kitchen tools are a sharp all-purpose knife (we use an 8-inch Global Chef’s Knife), 4-5 paring knives, and decent cookwear (Allclad is not the end all – there are many affordable options like Gourmet Standard). You won’t discover extravagant items, except for a gigantic stew pot from Emile Henry, wonderful for our veggie soups! As for those who live in highrises with a mere 3ft x 5ft balcony space, know that this area need not be unproductive. Part shade container gardens can grow spinach and other green leafy veggies. I’ve grown in large patio containers two highly productive tomato plants (plain old Early Girls). So the next time you see those photographs, give yourself a pat on the back that your tiny garden and kitchen are wonderful, productive working spaces worthy to blogbrag about. Send us your tiny garden or kitchen stories and photos!